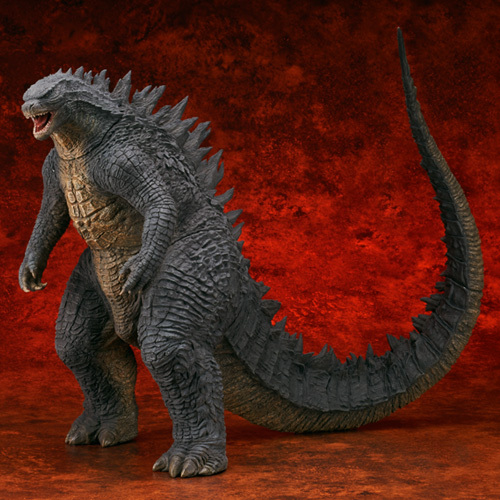 X-PLUS GODZILLA 2014! NEW ULTRA KAIJU! VINYL WARS MARMITS! It’s a COLLECTOR’s UPDATE! – SKREEONK! Hey all, Jon @ UnCanny here with some great collectibles as always! X-Plus finally revealed their painted Legendary Godzilla (2014) yesterday along with the new RIC exclusive – the flying Male MUTO! This is, in my opinion, a much better offering than the former yawning and/or roaring extra head… Which leads me into mentioning the atrocious neck seam that is still somehow plaguing this figure. The overall sculpt of this enormous 32cm G’14 is superb – and if they keep this exact paint scheme intact then we are in for one hell of a vinyl – but good LORD that neck seam! Bare in mind, what we’re seeing here is a RESIN (not vinyl) painted production model – so there is a slight chance the neck seam may go away. I don’t think it will, however, as X-Plus has filled these seams in photo-models of the past. This really isn’t that big of a deal and their resin prototypes always have seams at the neck, but not their photographed pieces. I’m just a bit irked that a vinyl specifically created to display at screen accurate, museum-esque quality, would have such a large seam so front-and-center. The fact that this seam made it to the photo session tells me that it’s more than likely here to stay – and may come into play with this figure in the future. Resurfacing of the extra head? Unlikely, but only time will tell. For now, it is the ONLY drawback to this superbly crafted take on Legendary’s Big G – so here’s to hoping it’ll go the way of the MUTOs and straight up disappear. What else is out there? For starters, X-Plus is also unleashing an Ultraman kaiju that has never been released by X-Plus before: Five King! At 27cm tall, he’ll make an excellent addition to any 25cm X-Plus Ultra collection! 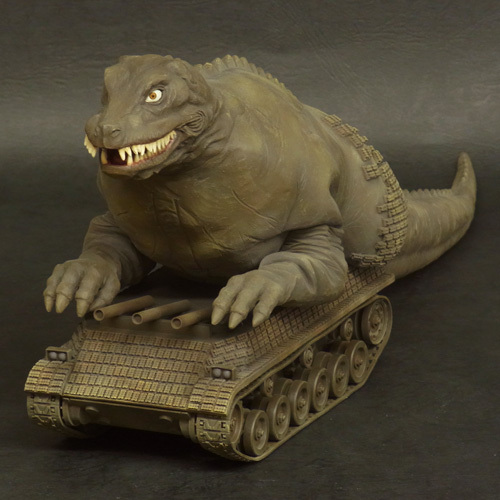 Dino Tank is here, too – and he’s a massive 50cm long! 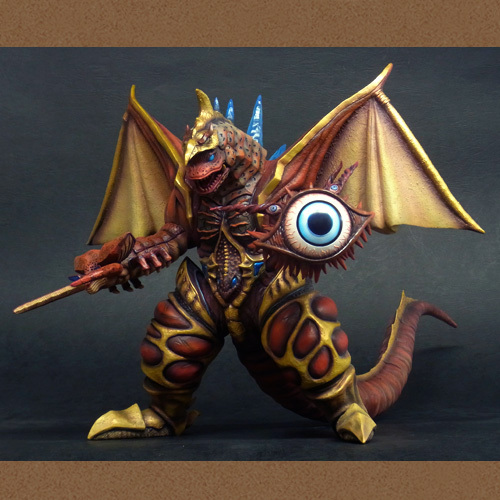 For those unfamiliar with Ultra Kaiju: A.) Watch the series, it’s a lot of fun – and B.) Dino Tank is exactly what it sounds like… A Dinosaur Tank. And he’s awesome. For full details as well as ordering information on any of the RIC versions of the three figures mentioned above, visit the official Ric-Boy X-Plus site by CLICKING on this sentence. Pre-Orders close MAY 13th – so get them in while you can! You may have to use a forwarding service like TENSO.com. If you want to opt out for the standards, we highly recommend going with HOBBY SEARCH. As far as what X-Plus is releasing in May – all of the following vinyls hit within the next few weeks! If you placed orders with Hobbysearch, AmiAmi, Ric-Boy, etc – prepare to pay for these guys and/or their shipping very soon! If X-Plus isn’t your thing and you’re looking for some great stylized vinyls, the Vinyl Wars line is still delivering some amazing reissues of classic Marmits, Bear Models, M1s, and many others. 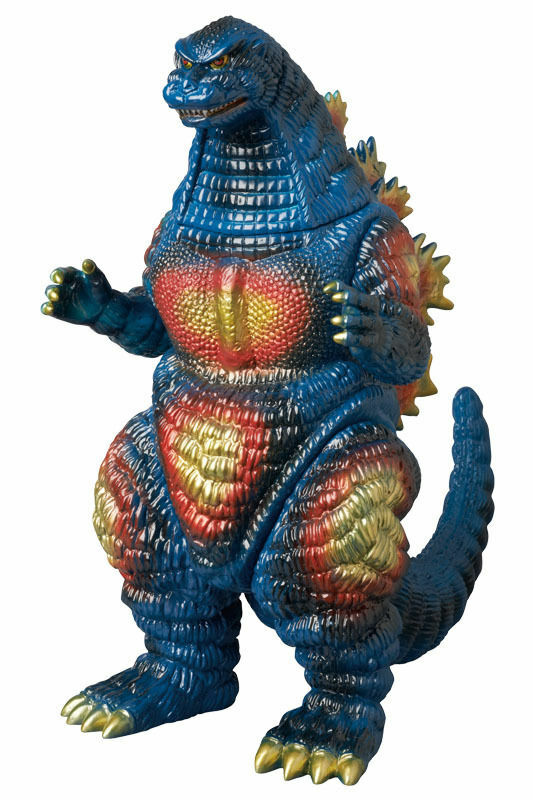 Most recently, they’re offering the very sought after GIANT Marmit Burning Godzilla (which stands well over a foot tall), two different Marmit Sleeping Godzillas, and many more which you can pre-order with us right here at our Kaiju Fan Marketplace! The Giant Burning G and sleeping Marmits are being offered for pre-order immediately, and are currently scheduled to arrive in November (subject to change). The sleepys are only $29.99 a pop – which is a great deal – and the Giant Burning G is only $159.99 – HALF of what people are asking for it on eBay and other places. If you missed out on ordering the Japanese release of these figures or that really isn’t your thing, you can still place an order for these with us and plan for their arrival later in the year! Lots of great stuff is coming this summer from DIAMOND (COUGH*Reissued Titanosaurus X-PLUS*COUGH) – so stay tuned to the Kaiju Fan Network sites for the latest news on all of your favorite kaiju collectibles! The fastest and easiest way to get daily updates on the upcoming American and Japanese movies and collectibles is by liking us on Facebook – so hopefully we’ll see you within the community there! Next Post Test Your Kaiju Knowledge With Official Skreeonk.com Trivia Quizzes! Previous Post Lots of New Items on the KFM – From Jon @ UnCanny’s Collection!